Did I make this recipe for St. Patrick’s Day? No. Do I love the fact that it just happens to line up with the time of year that everyone is looking for green recipes? Yes! 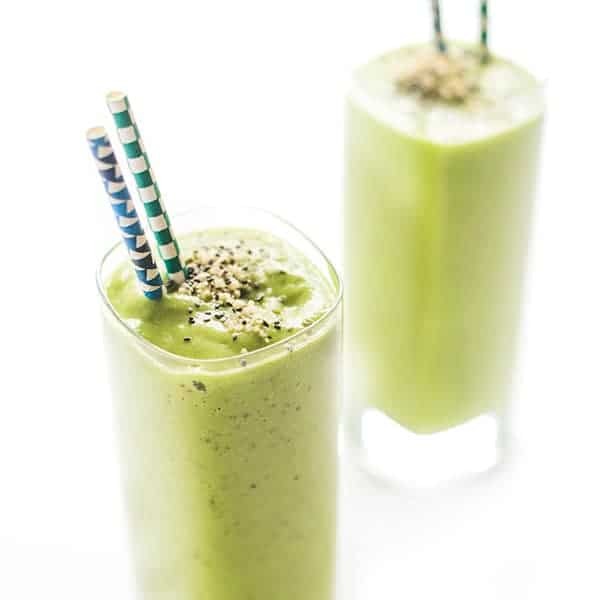 What I really love is the fact that this rich, creamy and luscious smoothie is bright green thanks to spinach and nature, not creepy bottles of food coloring and chemicals. Coconut milk is not only incredibly flavorful but it provides heart-healthy fats and a silky texture that will have your kids asking for seconds. In fact, my 18 month old drank 24 oz of this bad boy the other day! Each serving provides over 16 grams of fiber and 17 grams of protein so you’ll have lasting energy all morning long. Perhaps you’ll even be able to pass on the neon green donuts in the break room. To prepare glass, pour 1/4 cup or so of chia seeds on a plate. Run the rim of a glass under running water then carefully dip the top of the glass onto the plate until the rim is covered in chia seeds. I keep trying green smoothies and being disappointed, so I’m almost afraid to try this one. It’s an even bigger issue to get my husband to be willing to try it. I have saved the recipe, so I’ll probably get there, because it’s mostly flavors I enjoy. A few things I find that help are adding lemon juice and mint! I searched for a recipe this morning for a a green smoothie w/ coconut milk. I was so excited to find your since it uses mangos! We live in Guantanamo Bay, Cuba right now and have an abundance of fresh mangos off the trees, so it was perfect. I’m in heaven! I also added an avocado that was ripe and needing using up. Yummy ! This smoothie needs to be made in my kitchen ! Thanks for the recipe ! this is one of my favorite (& go to) smoothie flavor combinations. haven’t tried it with protein powder or chia seeds though, but might need to throw those in next time! Whenever I don’t add those in, I find myself hungry in 2 hours. Or if I’m working out, it really gives me more energy for the workout. I had a smoothie this morning, but not with coconut! Yum! Oooo you gotta add coconut next time!! Thanks Sandy! This sounds and looks awesome! I have some mangos that need blending! Yes they do!!! Especially ripe ones! I love how vibrantly green this is, Liz! I have been so obsessed with mango and coconut lately!! (Im even currently typing up a most that includes the two! haha) I CANNOT wait to try this!! I just LOVE green smoothies. esp. with peanut butter. Mmm…me too!! I’ve been adding almond butter a lot lately too! In LOVE with this Liz. This is SO my kinda smoothie!! yum! 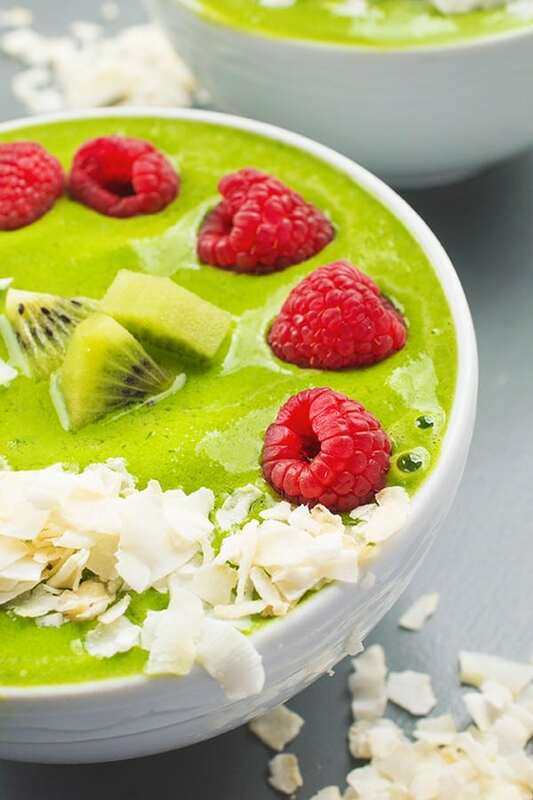 I’m all for green smoothies and I love the idea that this one has coconut and mango in it!!! I love using coconut milk in smoothies! 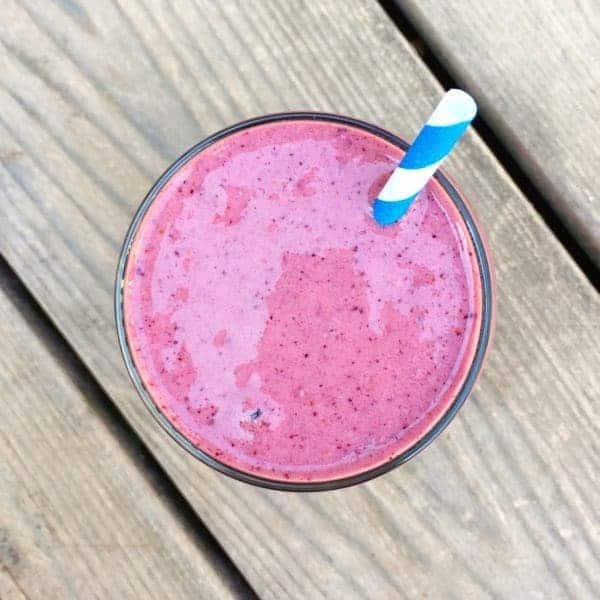 We’ve gotten into the habit of having a smoothie every day after we work out in the evening because they are a great way to refuel without excessive calories! Such a great post-workout snack!! You’ll have to let me know if you try any fun new flavors together!! 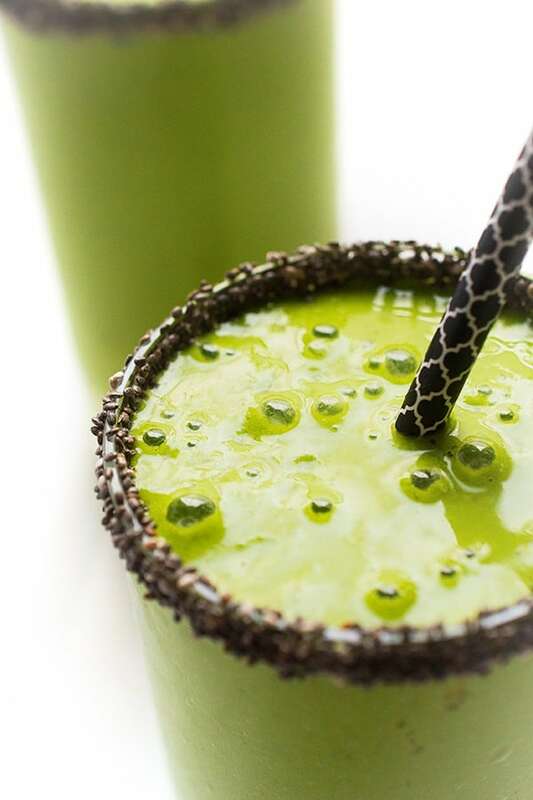 Love the vibrant green and coconut rimmed glass! What a pretty smoothie, and it’s packed with so much goodness. I don’t have protein powder, though, so I may give it a go with some ground flax seeds – what do you think? My boys make smoothies a lot after school, and I know this’ll be a hit! That sounds perfect!! I also love adding extra chia for protein. I hope you and the boys enjoy!! This recipe is so simple and natural. Yay for doing something naturally green, love it! It sounds and looks wonderful. I do love healthy smoothies. As I am on fast today and obssesing about calories, I did gasp a little, but only because I am only allowed 500 today. You could easily split in half! I exercise almost daily so I like to have a higher calorie breakfast to fuel my calories. Good luck with your fast! Looks great. 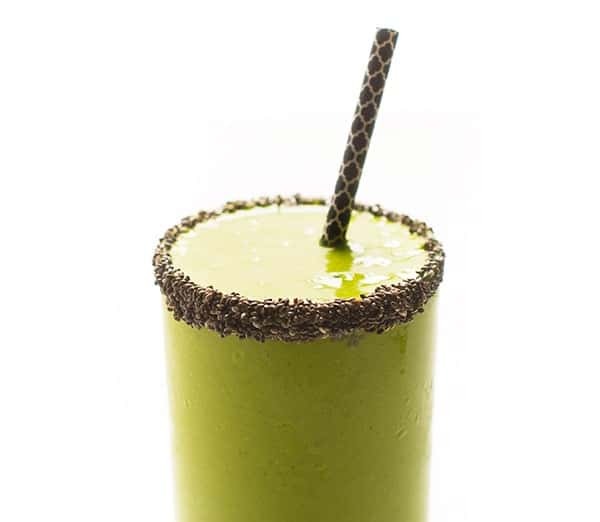 I love the coconut on the rim and I’m so crushing on chia seeds right now! 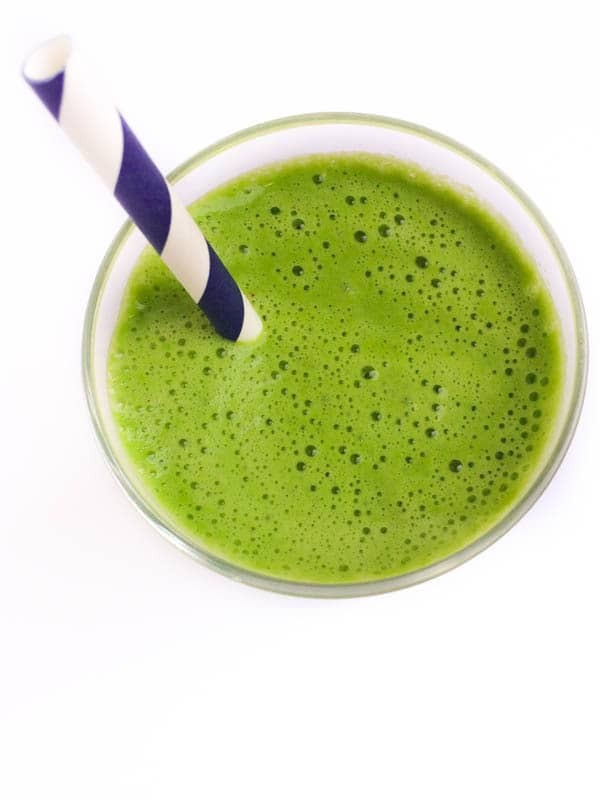 I have been noticing so many green smoothie recipes- i love how there is coconut milk in here. I have never had chia seeds in my life and i think i should GET IT NOW!!!! I am such a fan of coconut milk – adds such great texture!! Love smoothies and this one sounds like a winner. Mangoes and spinach ! Yumm ! Will be trying this sometime soon. Can I add this ( link) to my Smoothie Central page ? Yes of course! Glad you like it!! hahaha Isn’t it the best??? Man I love anything with coconut! Ooo this would be perfect for a cold!! No need! Love using fruit to naturally sweeten! Wow, I love how much fiber and protein this has! Perfect way to start the day! I totally agree! Plus it keeps you full til lunch! Oh, this sounds SO refreshing! I need to make this ASAP! It totally was! Let me know what you think Amy! How pretty that looks in your pictures and I’m sure it is super tasty!!! I have to try this very soon!!! It really was so tasty and vibrant – I hope you try it! I really haven’t got into making smoothies, but need to change that. What a great blast of protein and fiber to start the day! I hope you can try it Anne! So tasty!